Gene is a human, pretending to be a vampire because those guys currently rule the world. 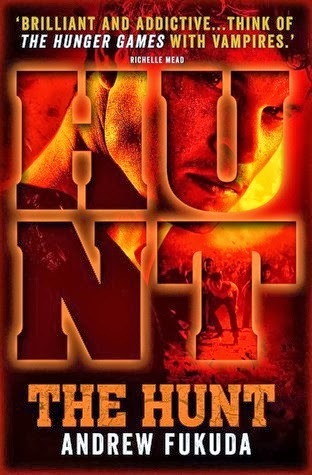 He is picked to take part in the Hunt, where vampires hunt humans. He goes to a place with a bunch of other candidates for the Hunt, and meets a bunch of humans who live in a Dome. He has a relationship with a supposed vampire girl called Ashley June, who is later revealed to be human too. The vampires discover that he’s a human, and they start to hunt him as well as the others. Gene and Sissy and her family escape on a boat. Gene discovers that his father is The Scientist, who left behind a journal and took care of Sissy and the others. Gene and the gang follow The Scientist’s map to the mountains, and Ashley June is left behind. Oh no. The novel opens with Gene briefly explaining how to live in this world full of vampires. His father was bitten one day, and he ran into the sunlight before he had the chance to turn. Since then, Gene has been alone, pretending to be a vampire in order to survive. There is a Heper Hunt held for the first time in a decade. There’s a lottery to decide who is going to take part. Gene is, obviously, one of the winners. As is Ashley June, his love interest. They’re taken to the place where the Heper Hunt is held, and Gene notices a heper village, which is covered and protected by a dome during the night so that the vampires can’t kill the humans. Gene and the other tributes heper hunters are given the lowdown on hepers. Apparently humans are slow, simple creatures. While they’re at orientation, the vampires with Gene think they can smell a human. It’s obviously Gene, but they think that it’s the humans inside the Dome. The people in charge explain that there is a heper in the building, and the vampires are allowed to observe it. Gene finds a journal written by someone called The Scientist. Gene goes to the hepers’ village, and bathes in their pond so that he no longer smells, and the vampires can’t smell him any more. The people in charge of the Heper Hunt explain that the hunters will be given various equipment, such as sun block or better shoes for running and chasing. These people want the winner of the Hunt to pen a memoir about their victory, and about the Hunt itself once it is over. Gene goes to the hepers’ village a second time, and asks them for water. He actually meets the humans this time. The most important one is Sissy, who’s basically in charge. They show Gene around the village. A vampire runs at the village before the Dome goes up at dusk. He starts to burn, but their bloodlust drives them forward. Sissy throws daggers at the vampire, who is called Beefy, which is Gene’s name for him. Gene tackles Beefy but only slows him down for a second. Beefy climbs the rising Dome, but doesn’t make it inside. He is crushed to death. Gene discovers that Ashley June is also a human pretending to be a vampire, just like him. Ashley June and Gene discover a map in The Scientist’s journal. It seems to be his escape route, and leads towards the eastern mountains. Ashley June and Gene go to some sort of Gala, where there are paparazzi taking photos and asking questions about the upcoming Hunt. Some hunters see Gene in the sunlight and they realise what he is. Gene goes to warn Ashley June that they know that he is human. And that they’ll be coming for him. Ashley June suggests that they go to live in the Dome, since it runs on autopilot and the vampires wouldn’t be able to get to them. They run, and Ashley June is cornered. Gene has to leave her behind. Gene finds a letter addressed to him, from Ashley June which tells him to “bring the hepers back”. Gene grabs a horse and goes to find the hepers, who are no longer in the Dome because they thought it was broken. Gene finds the hepers, and tries to convince them to go back to the Dome. They’re angry because Gene didn’t tell them about the Hunt. Sissy wants to run away, because she sees the Dome as a prison. The hunters find the humans and there is a fight. The humans escape, and they start following the map to the mountains. First they need to find the river. Gene is sad because he has to leave Ashley June behind, but in my opinion it’s okay because who needs that instalove? The group of humans find a boat, and Gene almost gets left behind but he dives into the river and swims to the boat. The others heave him up. They keep drifting down the river, and the vampires have to leave before daybreak. The vampires keep coming back during the day, though. It seems to be impossible to outrun them. Gene looks at The Scientist’s journal, and finds out that The Scientist is, in fact, his own father. Heper Hunt – Held every once in a while to boost morale, to get rid of humans, to provide entertainment… It’s not very nice.